What’s Our Next Step in Spreading Great Practice Around #TELT? In Ontario we know we have pockets of excellence when it comes to Technology-enabled learning and teaching. When I refer to “pockets of excellence”, I mean schools and classrooms where learning to do this, digging into doing this well, and supporting the understanding of how learning needs to change to meet the realities of today’s world, are front and center in their thinking and sharing. Progress in improving learning and instruction through the use of technology is not “by chance” in these spaces. This is where communities are working hard and inviting input into figuring it all out. The work of eLCs in Ontario has shifted significantly this year into a leadership role in boards to enable a better understanding of how we can use technology to enhance learning and teaching. As we worked to build capacity/capital in the eLC community, engaging them in conversations and learning with these ‘pockets of excellence” became a priority. Last week, many of the northern eLCs (Thunder Bay Region, Sudbury-North Bay Region, Barrie Region) went on a “field trip” to do school and classroom visits. 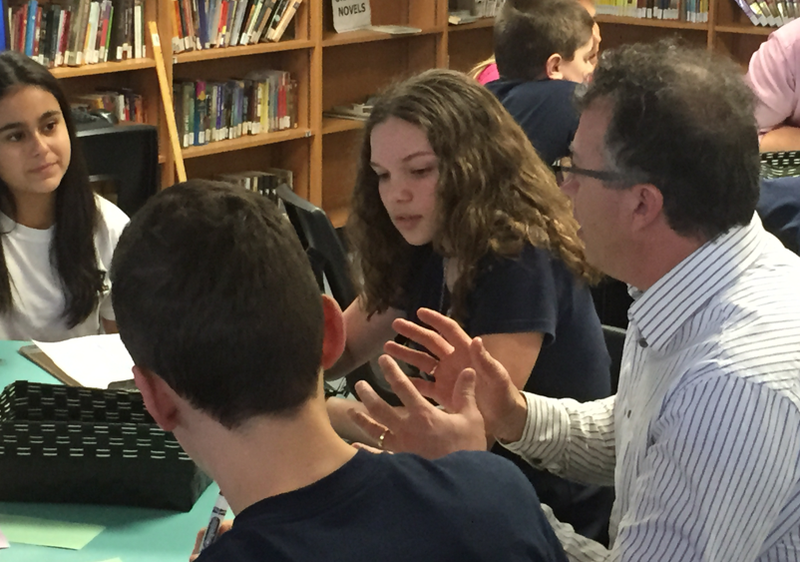 ADSB eLC Tyler Hankinson listens to ASPS students reflect on TELT in their school. 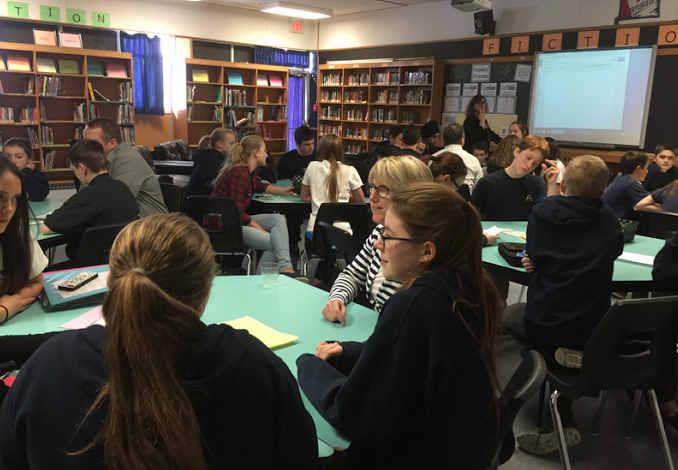 SGDSB eLC Stacey Wallwin and eLO EO Margo Palmeter share learning with students from ASPS. The connections, the conversations, the learning and the sharing were incredibly rich. 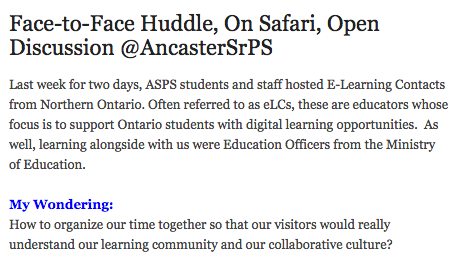 The eLC visitors and the host schools have been sharing their learning through their blogs. Some of these are posted below (eLCs/hosts: please contact me when you have more visible thinking to add to this list). Host Aviva Dunsiger: Class Learning and Personal Reflections. How do we continue to spread and share our thinking about how learning needs to happen for our students in a world where the industrial model no longer meets their needs? How do we create the conditions in Ontario to allow teachers to be researchers into best practices for student learning? 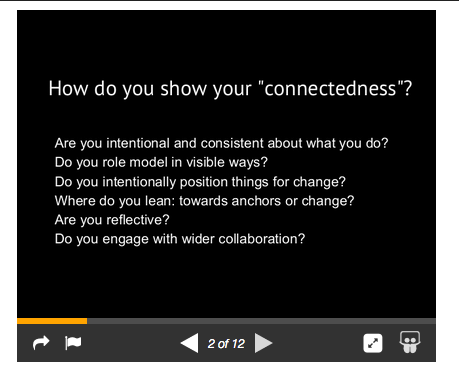 How do we continue to deepen the conversations and engage all educators in reflective practice? How do we ensure that all of our classroom (bricks and mortar, and online) educators access the richness of learning available online 24/7? With the structures currently in place in Ontario, what needs to happen to ensure optimum learning for students in every class? Your input is both welcomed and appreciated. How do I get involved with this? Is it the board or individuals? It’s so awesome to hear from you. I hope everything is going well for you on the “other side” of Northern Ontario! 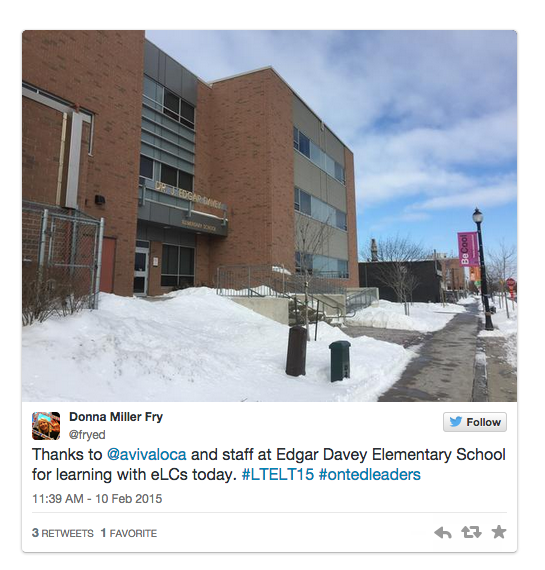 I work with eLO and the #eLCs in boards across Ontario. We are looking at how best to lead technology-enabled learning and teaching in the province and input is welcome from everyone. I’ll be in touch with you about your thinking in this area. I know that you have some awesome practices to share. Donna, I’ve been thinking a lot about your post and how I wanted to reply. Here’s the thing: do all educators and administrators agree that a change needs to happen? I think that this change starts with a firm belief that there NEEDS to be a change. We’ve had lots of PD opportunities discussing our students, their needs, and how we need to respond to the changing realities. But if we don’t embrace the philosophy behind this change, I wonder if a change will actually happen. What do you think? For those that don’t embrace this philosophy, why is that? What might make them re-think things? Maybe it’s all about embracing small changes and building from there. I’m curious to hear what others have to say. I often wonder why change seems to be so hard. This past summer, someone said to me that leaders in education in Ontario (and elsewhere) are clinging to the structures that have worked for them all along without recognizing that those structures are based on old thinking and that they don’t work in today’s world (except for in the school system). I have worked for so long embracing “small changes”. In 2002, I was doing synchronous online classes with kids in Chile, Kazakhstan, Kenora (Ontario) and Pakistan. Today, I see online classes where kids are bored to tears with text-based “content delivery” and this is 13 years later!! I get impatient with small changes. I am frustrated with how many students are sitting in rooms where practices haven’t changed in 30 years or more. The slow pace of change seems to be getting us further and further behind where we need to be. So I think you are on to something here. Is it true that educators believe a change needs to happen? Or are some just trying to survive an overwhelming role? Visiting your class and the other host classes helped me to see how progressive some practices are, and how far we have moved in our learning about student learning needs. I am anxious to spread this learning. Working to demonstrate the NEED for change might well be a good starting place. Thanks so much for taking the time to share your thinking about this. 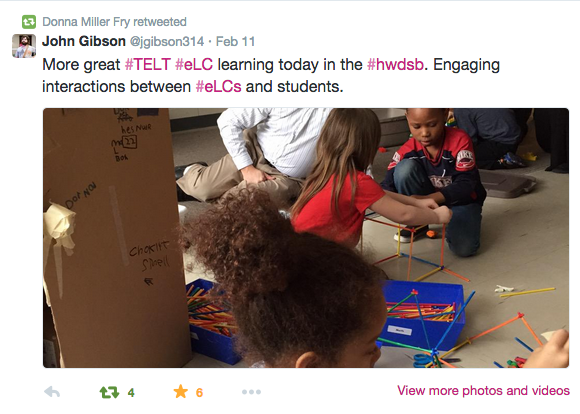 And, I can’t thank you enough for taking time to share your learning f2f with our #Ontario #elcs last week.